I'm Dreaming of a Pink Christmas! So I have to admit that I'm a bit traditional when it comes to my Christmas decorating. Yes, I love my mom's teal tree that she puts up every year. But if I'm being honest, I have to admit that red, green and white has always been my palette of choice. But here lately I've really been appreciating some of the more unique color pairings that have been popping up. Like this beauty of palette. Pink and gold, anyone? Looks pretty dreamy to me. Things to be on the look out for: Gorgeous vintage ornaments, sequin accented gown, the prettiest and most festive table setting I've seen all year, and did I mention macarons? Fun and festive! Don't you think? I seriously can't get enough of sparkly gold. And with pink? Well, it's just a match made in heaven. And while I might opt to skip this color palette for my Christmas decorating, I can definitely see myself using these colors for a New Year's Eve party or even a bridal shower that falls in the month of December. So what do you think about these colors? And are you a traditionalist when it comes to holiday colors? Or do you dare to be different? 7 Comments " I'm Dreaming of a Pink Christmas! " For me, Pink and Gold always does it regardless of the season! So beautiful! My oldest girlfriend's family always put up a pink and gold tree–it was spectacular! 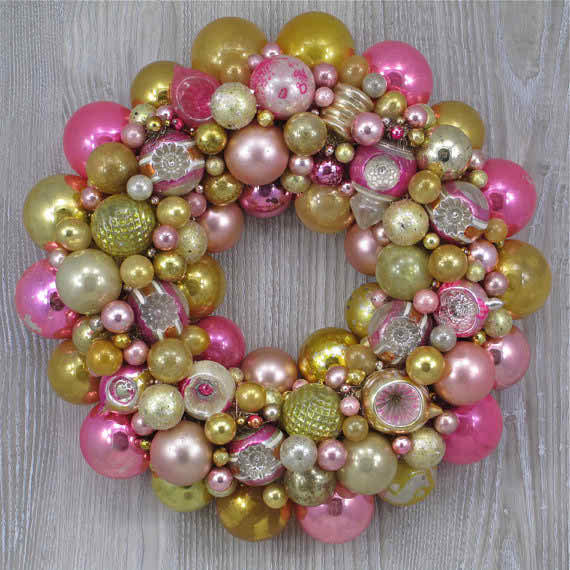 Love the idea of a pink Christmas!